First Aid Kits- A Requirement or Recommendation? Don’t be Oversold! What do you really need in your first aid kit? Some employers pay vendors to periodically inspect and supply their first aid kits. During their visit, a vendor may be quick to say “OSHA requires…” this, that and the other thing. The Occupational Safety and Health Administration (OSHA) states in 29 CFR 1910.151, “Adequate first aid supplies shall be readily available.” OSHA goes on to reference American National Standards Institute (ANSI) Z308.1-1998, “Minimum Requirements for Workplace First-aid Kits,” to provide an example of what should be contained in your first aid kit. KPA recommends employers provide first aid kits that meet the minimum requirements set forth by the 1998 ANSI standard. Do not allow a vendor to “oversell” you contents for your first aid kit; stick with the requirements. Since 1998, there have been revisions to the ANSI standard but OSHA has not modified the regulation to include the most recent revision. Vendors may make the interpretation that since the ANSI standard has been revised they can use this as a selling tool to provide additional contents in your first aid kits. What the vendor is proposing is their recommendation based on an ANSI revision which has not been incorporated into the OSHA regulation. 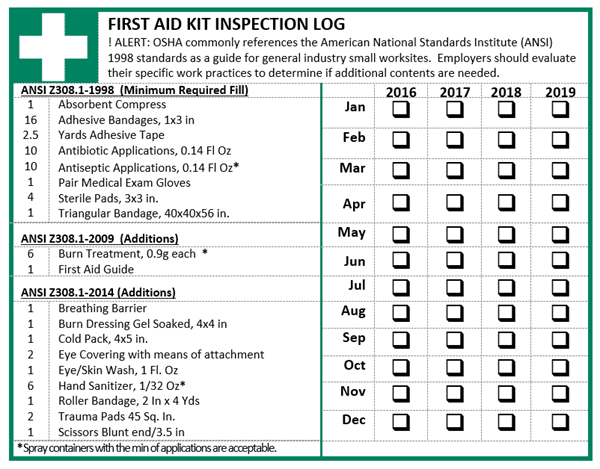 On the First Aid Kit Inspection Log below, you will see the list of minimum requirements and the additions that were included with the next two ANSI revisions. Based on the potential hazards in your workplace, there may be additional contents you want to include. Your KPA Risk Management Consultant can assist you in making that determination in conjunction with local fire/rescue department or appropriate medical professionals as needed. If you choose to maintain your own first aid kits refer to the log for guidance. These supplies are readily available in local stores at a fraction of the price you may be paying for vendor services. OSHA does not “approve” the contents of first aid kits, however, an OSHA inspector may cite you if the contents are not adequate to respond to an injury requiring first aid treatment. Size and placement- The contents listed are based on a small business; larger businesses may require additional volume. Availability-First aid kits must be readily available. You may need multiple first aid kits in your facility to ensure they are available and easily accessible to employees. Marking-First aid kits and locations shall be clearly marked. Inspections-First aid kits shall be routinely inspected and expiration dates verified. State regulations may be more stringent than federal regulations. Contact a KPA Risk Management Consultant or email [email protected] to determine the requirements for your location.